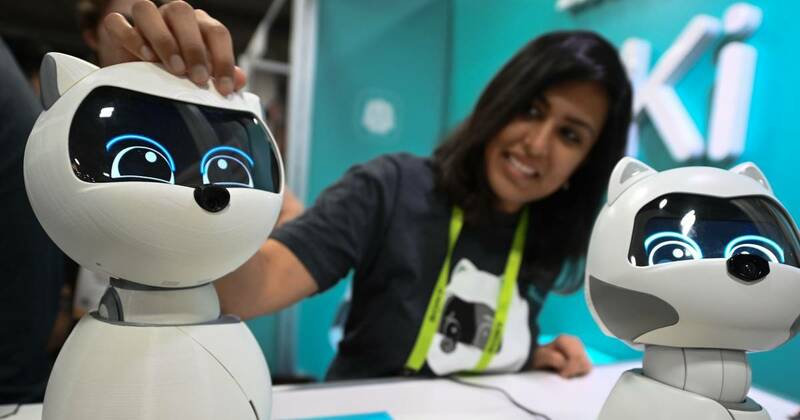 LAS VEGAS — When Mita Yun gives a demo of the cute, cat-like pet robot Kiki, which includes microphones and a camera in its nose, she broaches the issue of privacy before even being asked. Yun — the co-founder and CEO of Zoetic, the company based in Santa Clara, California, that is behind Kiki — is quick to point out that the “AI companion” can recognize your face but doesn’t relay that information over the internet. “Kiki’s entire brain is only on the device,” she said. The robot only communicates over the internet to receive software updates. In years past, that kind of clarification might have been of interest only to the tech-savvy or privacy conscious. But at the 2019 Consumer Electronics Show, privacy considerations were top of mind. “It is becoming a differentiator for companies to say they’re concerned and sharing how they are protecting people’s information,” said Tom Coughlin, a fellow at the Institute of Electrical and Electronic Engineers, a trade group, which had a presence at CES. In years past, privacy was an afterthought for many tech gadgets. But 2018 was the year of the great privacy awakening thanks to a number of high-profile breaches, Facebook’s privacy woes and some particularly troubling incidents with smart-home devices, such as when the voices of strangers came through Nest cameras and spoke to children. Privacy considerations come as smart home devices continue to make their way into almost every part of people’s lives. The show floor of CES was packed with smart everything, from clothing accessories to home appliances and mattresses capable of communicating personal information over the internet. The Consumer Technology Association forecasts 29.4 million smart home devices will be sold in the United States this year. Meanwhile, total U.S. consumer tech revenue is slated to reach a record high of $398 billion in revenue. Alongside those gadgets was a growing number of companies offering privacy solutions. Winston Privacy, a new hardware device that plugs into a home network and claims to protect smart home devices, was one of the solutions making its debut at CES. “It’s really simple, plug and play. It takes 60 seconds,” said Richard Stokes, founder and CEO of Winston Privacy. Once the hardware is plugged in, Stokes said Winston Privacy’s dashboard can tell users how many threats it has stopped from accessing smart TVs, thermostats and smart speakers. “My personal record in one day is 350,000 on my home network,” said Stokes. Like, it’s so crazy to make this announcement right now at the first CES I’ve ever heard anyone talk about privacy. And practically EVERYONE is talking about privacy. Bigger tech companies are also starting to work together to offer enhanced privacy options. At CES, security firm McAfee and Google announced they’re teaming up to support voice commands for McAfee’s smart-home security system. The system is meant to protect connected devices, also known as “internet of things” devices,” from attack. While Apple kept with tradition and did not attend CES, its billboard stood out as one of the defining messages of CES 2019, said Tuong Nguyen, senior principal analyst at research firm Gartner.